The debut launch of Pure Essense in Tapei, Taiwan in April 2010 was covered by all local media and created buzz and excitement. Pure Essense outlets are found in the Prestigious 101 building and Takashimiya department store. Celebrity Jazz singer, Olivia Ong from Singapore endorsed our Pure Essense product at the opening of our latest store at Breezes in Taiwan, September 2010. Awarded "the best gift product or range" for Pure Essense Handmade soaps.
" Your skin looks amazing, what have you been using? This was a comment from my friend of mine recently. For the last 3 months I have started using the Regenerative Face Serum on a daily basis. My face normally breaks out with the start of any facial care routine and I find after 2 weeks I have go back to just washing my face with water. Not only that I suffer from breakouts on my face and neck. Doesn't matter what I used I just had to deal with them and cover it up the best I could. I just want to write and say how much I love the products, particularly the Synergenetic Face/Skin Therapy. I love the fragrance particularly and it's consistency - not too oily yet smooth and hydrating. The Foaming cleanser is also my favourite. Thanks again for contacting me to enable me to purchase these beautiful products. While staying at the Silver waters resort at Phillip Island, my husband and I tried your Pure Essense " SPA range". We both liked it so much, I contacted you by email to inquire whether we could buy these products. I thank you for your prompt reply to my emails and great customer service. Now we are enjoying the SPA range Green tea shampoo, Pomelo conditioner and Rosemary & olive body wash at home. After your recommendation, I also purchased the Regenerative Face serum with the gifts as a generous surprise. I want to let you know how much I liked the Regenerative Foaming cleanser and Skin Therapy day lotion. I love the fragrance of the day lotion, it makes my face feel fresh, clean and renewed. In recent months, my face had lost its usual vibrancy. I think the office air conditioning and heating has taken its toll and the stress of life was showing. My usual trusty moisturiser had lost its effectiveness. When I shared this with you, you recommended the Regenerative Face serum and the Synergenetic Skin Therapy moisteriser. They were truly the Dynamic Duo !! Immediately, my skin felt supple, absorbing all the moisture. Then over the week, my face regained its radiance with fine lines minimalised. Now, over a month of using these two products, I can't thank you enough for your recommendation. I know you will find great success as more people discover these therapies. Just a few words about your beautiful Sacred Life Lilly Pilly Body Lotion which I just discovered. I stayed in different places a lot due to my work, recently I had to organise last minute accommodation as my husband has been ill in hospital and we live out past King lake. Of course I didn't have my toiletry bag and felt quite disorientated, stressed and not looking forward to having to use the apartments usual round of the mill shampoo, soap etc. It was such a lovely surprise to find your lovely range of lotion, shampoo and body wash. The fragrance is not over powering, but subtle and fresh and I really enjoyed using them and smelling lovely. Needless to say, I took the two little tubes provided and still using it......Just squeezing out the last few drops. I am writing to say congratulations on a such a beautiful product. The Sacred Life range is so good my hair hasn't felt this soft for ages, especially in the North West of W.A where water can be extremely hard or bore water. We first tried your product at an Indigeneous community on the Dampier Peninsula called Mercedes Cove, it was provided in the cabins and was enjoyed by all of us at the time. I haven't found it anywhere else so we finally got on line, and are ready to order. Hi Robert, I recently enjoyed a stay at beautiful Yabbaloumba Retreat in Qlds's Sunshine Coast Hinterland. Being a first class retreat, it was no surprise to find high quality complimentary toiletries here, but the Sacred Life shampoo, conditioner, body wash and body lotion exceeded all expectations! What a treat! The beautiful aromas that wafted out of those tiny tubes were out of this world and filled our accommodation with their wonderful perfumes. Using them was like having a holiday within a holiday - taking the senses on a Aussie journey with the scents of Kakadu Plum, Lili Pilly, Desert Quandong & Lemon Myrtle. I cant wait to receive my order of Sacred Life products and to bring that touch of luxury to my home. While staying at a Bed & Breakfast in Tasmania, I had the pleasure of using the Pure Essense shampoo and conditioner. The difference it made to my curly hair was amazing. It was so much softer and more manageable. I am happy to recommend these beautiful products and am glad I found them. On our recent stay at the Comfort Inn Ringwood I had the pleasure of using your Green Tea shampoo and Pomelo conditioner. I was so pleased how my hair was after using your products. I am so pleased that I can purchase them from you. I have used many other products over the years and nothing compares to yours. And also thank you for your quick reply to my email. Hopefully in the next week I will have your products to use, thank you once again. Thank you for your assistance recently in arranging delivery of the SPA Care products. We have traveled quite a bit both overseas and in Australia and must admit we have often been somewhat skeptical about the quality of hair care products generally supplied in hotel and rental accommodation. Recently we stayed in the Beach Retreat apartments at Eden, NSW and were more than pleasantly surprised by the results from using the Pure Essense SPA shampoo and conditioner that were provided. They gave a real sense of leaving hair clean and fresh. We were obviously impressed enough to follow up with you and purchase these products for regular use. We have been very happy that we did. Thank you also for the Sacred Life samples which we have yet to try. Having recently stayed for a short business trip at the Admiral Motor Inn at Rosebud, I was able to use some of your products. As I have sensitive skin, I was a bit apprehensive, but found your Sacred Life Body Lotion and SPA body wash to be lovely to use with no skin reaction. I love the fragrances and the fact that the ingredients are all natural and chemical free. Keep up the good work and I hope to find and use more of your products in the future. I have been using your Lemon Myrtle Shampoo and Kakadu Plum conditioner after finding them at Melbourne's Royce Hotel. I am usually wary of hotel products, but yours looked " far to good to leave behind"! The naturalness of the ingredients, the lack of irritants and the lovely packaging appeals to me. Living in humid coastal S.E QLD, Summer is a real challenge for wavy hair like mine. So I am really delighted to find a product which suits my hair and calms my scalp. Thank you for your lovely range - I plan to continue using it. I recently got to sample the Pure Essense SPA shampoo and conditioner while staying at a holiday house on the Mornington Penninsula and I love it so much that I contacted the manufacturers and was delighted to find out that I was able to purchase them in 1 Litre bottles. The Conditioner leaves my thick coarse hair soft, shiny and manageable, and also calms my itchy scalp which suffers from Psoriasis. I am so pleased I've discovered it - It's lovelier than any I have every bought from shops. I just want to say a BIG thank you. I have sensitive skin but I love the Sacred Life range. 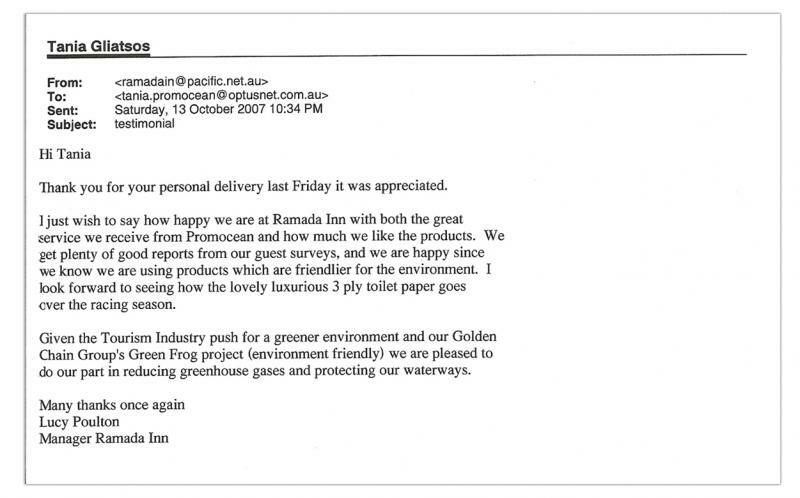 I recently stayed at the Statesman Hotel in Curtin ACT where I found your products in the rooms. I would dearly love to continue with this range as I had no reaction to it at all. 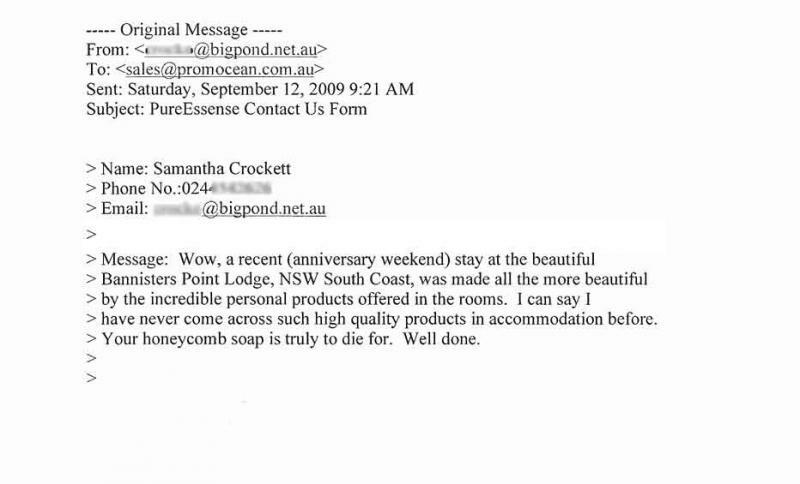 I am writing this to advise you on a product of yours I uses at the hotel which was the Esplanade in Lakes Entrance. The Product being the SPA Green tea shampoo and SPA Pomelo conditioner which I really liked due to having PSORIASIS on my scalp as well on my hands. I found it to be very gentle and no irritation on either and my hair felt great. I also tried the handcream which it had a great texture and also no irritation. So I called your office & arranged an order, so glad I can buy it and continue to use this product as it is difficult to find a suitable product for psoriasis and suit your hair as well at the same time. I have been using the Regenerative Face Recovery Serum for over a year now. It is a regular part of my morning and evening skin regime. I believe it has made a difference to my overall skin tone and has helped to reduce the appearance of fine lines and enhance skin firmness. I use it straight after cleansing as a base and a conditioning serum for my face before I apply my moisturiser. It leaves my skin feeling firm and soothe and it is a great primer that appears to enhance my moisturiser's effectiveness. I really love this product and would not hesitate to recommend it as a nourishing and supportive product that will compliment any women's skin regime. Thank you Robert for giving me the opportunity to try this wonderful product. It will always be a part of my daily routine. During 2014, I had experienced on-going problems with skin eruptions on my scalp. I tried different brands of shampoos and hair conditioners, however, the problem continued. I resorted to seeking medical advice and this resulted in my taking antibiotics. However, the problem reoccurred. After the frustration and not wanting to continue with antibiotics or medical lotions, I sought advice from a pharmacist. This resulted in my trying baby shampoo which I was told had fewer chemicals in it. This did NOT solve my problem. I tried a variety of different baby shampoo but to no effect. I happened to be holidaying on Norfolk Island and stayed at the Islander Lodge Apartments. Included in the welcome package was a 30ml container of Pure Essense SPA green tea shampoo & one of Pomelo conditioner. After using these two products my scalp cleared up totally! However, once I went back to normal commercial products from the supermarket / pharmacy, the condition simply flared up! I searched on the web to see if I could source Pure Essense products myself and luckily I was able to find and purchase them online. A great result and I look forward to no more scalp eruptions, nor antibiotics! On our recent visit to The Mary River Wilderness Retreat in the Northern Territory, my daughter and I discover your Sacred Life lemon myrtle shampoo, Kakadu Plum conditioner and Desert Quandong body wash products beautifully presented in our room. We were delighted with their natural fragrances and had to sample them. .....Hope you like this picture taken on the Wallaby Walk whilst we were at Mary River. I want to say Thank you for your kindness & support in assisting me with some of your products. Not only have you helped me with a product that suits my hair type but now you are assisting me with some skin care products. I have very fine long hair that is prone to oiliness & after trying your SPA range while staying at a hotel at the Hunter Valley I was amazed at the results. My hair is now more manageable & feels & looks sensational & I don't have to wash it as often. I have used the SPA hair care range ever since. I have now used your Re-Generative Facial Serum for approx 3 months. I must say it is another amazing product. I believe I have noticed some very positive results on my overall complexion. I use it twice a day under my moisturiser & I find it helps lock in moisture & helps boost my moisturiser effectiveness. It applies easily & a little goes a long way. My overall skin tone feels firmer & I believe my skin has a healthy glow about it. I really like this product & it will remain a part of my daily skin routine. 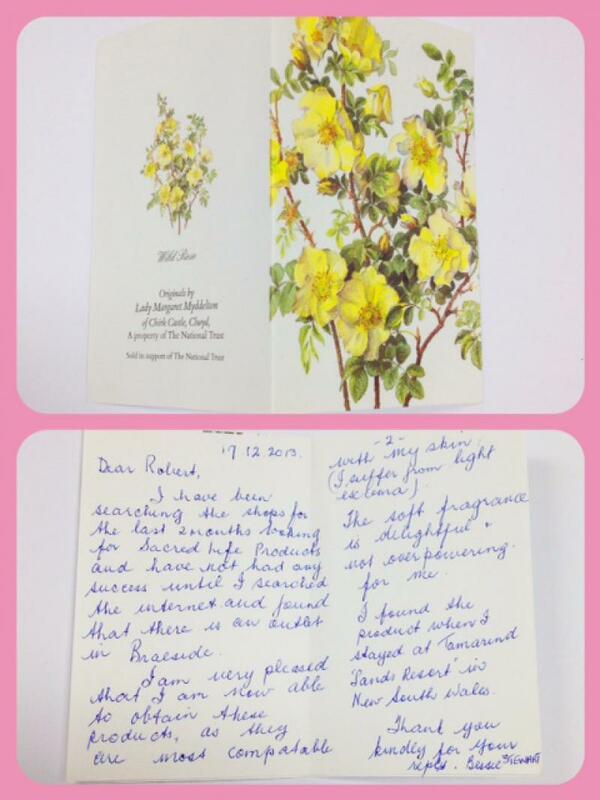 Thank you again Robert for showing such a genuine concern & continued interest in helping me find the right products. I truly believe you have developed some amazing products & I would not hesitate to endorse them to others. Last December my husband and I attended a John Legend concert at a Cold Stream vineyard. We stayed at the Yarra Valley Motel in Lilydale. The shampoo and conditioner that I used for my shower were amazing because my scalp did NOT get itchy at all until I started using my expensive Professional Salon brand shampoo at home. For years all other brands gave me the same problem. 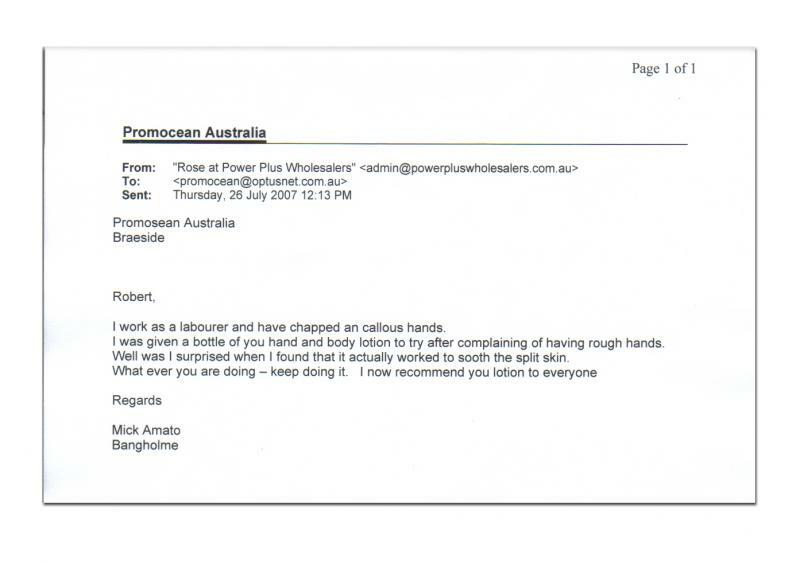 On inquiring about that " amazing shampoo " we were informed a company called Promocean produced it commercially. That shampoo is called Pure Essense range- hydrating Shampoo Green Tea. It is not available at retail stores. BUT as a special arrangement, Promocean would sell a bottle to me. I am so grateful for that. Now there will be no more suffering from itchy scalp. 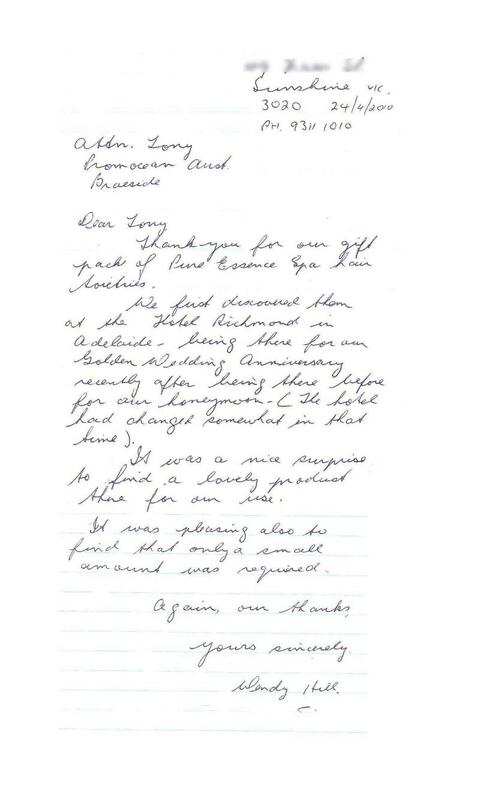 Your father asked us to write to you to let you know how much we liked Pure Essense. My name is Aileen and my husband's name is Peter. At Christmas we went to Lakes Entrance to visit our family and have Christmas dinner with them. We stayed at a hotel called Bellevue on the Lakes and they provided all their customers with Pure Essense SPA products including shampoo, conditioner, and lotions. We both enjoyed using Pure Essense and Peter was especially pleased because he has tried many, many body lotions but was never satisfied until he used Pure Essense hand & body lotion. Now he is very happy and we are purchasing some for ourselves. I particularly like the lovely scent and the fact that it is non greasy when used. At the end of Nov 2014, I stayed at RACV Noosa and really loved the bathroom products supplied in our room. I particularly enjoyed the Pomelo Conditioner as it made my hair feel so smooth. The Green tea shampoo and Rosemary & olive body wash in addition was great. Trio of products I love that I was able to order some through you to use at home. You recently forwarded a box of Spa Products to me. Thank you so much for your "service with a smile" response to my request. My husband has a scalp condition which has been very difficult to alleviate. By chance, while staying the Victorian Apartments in Port Fairy, he noticed a huge improvement. We eventually realised this was due to the Spa products, particularly the shampoo and conditioner, provided in the apartment. After trying for many years to find a solution, we couldn't believe our luck. Thank you also for the very prompt delivery. First time I have tried Pure Essense shampoo and conditioner couple of years ago and recently decided to find out where I can buy this in Australia. That is how I met Lauren and Robert. It is a good luck that a such great product is accomplished with very good service........And the quality of Pure Essense production is amazing! I have long, quite dry and knotting hair. The Green tea shampoo and conditioner make is so easy to look after. Using these products I can easily brush my hair. It looks so well nourished and shiny after washing. Definitely recommend using Pure Essense shampoo and conditioner and purchase them from Lauren and Robert! I just had to write this testimony to tell prospective purchasers of Not only this companies products but all of the dealings I have encountered. After trying and testing four companies brands of different monetary value I came across " Pure Essense". The difference between this company and others I have dealt with is the product is quality. 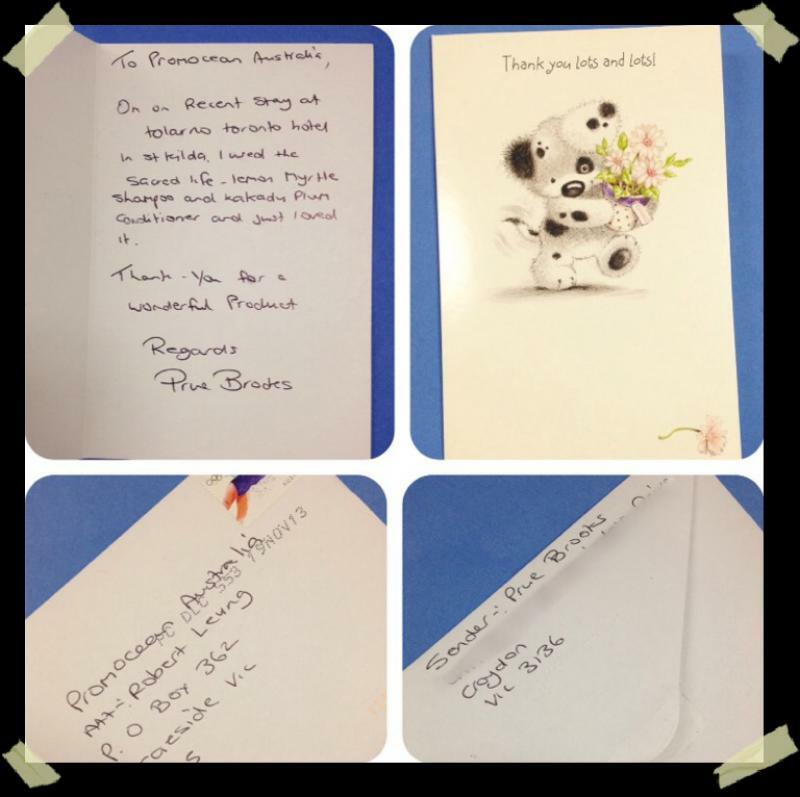 Promocean not only cares about their product but more importantly their customers... nothing is too much trouble. We have been using this product for over 3 years now....more importantly we get glowing feedback as guest's state how wonderful their hair or skin feels after using it. Pure Essense is exactly what is states the quality is high, the presentation is delightful but the fragrance is enriching to the spirit. Don't take my word for it, get a sample, " You wont be disappointed....... I haven't ! Thanks Robert, John and Nelson for making my life a little easier ! I recently stayed at Punt Hill apartments in Flinders Lane with my sister. The Apartments were very comfortable, whilst there I washed my hair with Green tea shampoo, and used Pomelo conditioner made by Pure Essense. I was so impressed with this product I went looking in the shops for it & was disappointed when I couldn't find it. 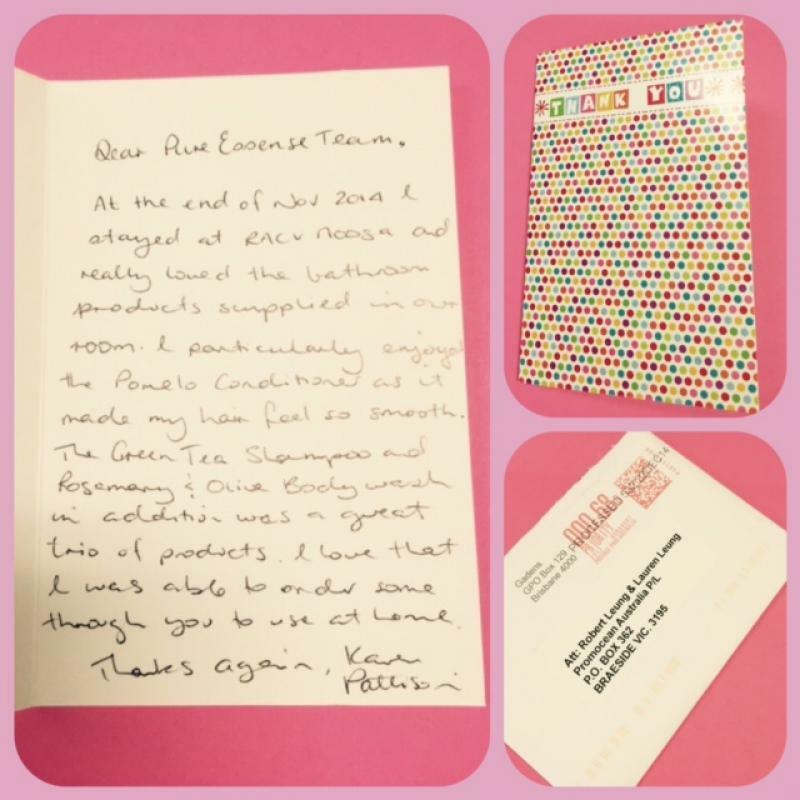 My hair had body and a lovely shine and smelt wonderful after using Pure Essense. My friend Jo, found the telephone no. and contacted you, and she said that you told her I could buy Pure Essense from you, thankyou so much. We recently stayed at the Royce Hotel in Melbourne where we were lucky enough to experience the Sacred Life range of toiletries. The quality and fragrance of these products were so amazing that we have since purchased some larger containers for use at home. We will definitely be recommending this range to our family and friends!! Hi Robert & Lauren, I just wanted to say a BIG Thank you to you for the awesome SPA green tea shampoo!! I LOVE it !!! I stumbled on it at a hotel in Sydney. I couldn't believe how good my hair felt! Keep making awesome products !!! I just wanted to send a big Thank you to your team and especially Robert Leung for your help with creating a soap to help me propose to my now fiance. A few months ago my girlfriend and I stayed at Tier's View Bed and Breakfast that had soap that my partner fell in love with. Besides the fact that they smell, feel and look brilliant, they also caused no irritation to my girlfriend whom has difficulty finding good hypo-allergenic soaps. From that experience I found the Promocean site and ordered a large variety through Robert Leung, and they were again great. I noted that some of their soaps were translucent, so I enquired to Robert if they could possibly do a one off soap with "MARRY ME" inside? Robert was enthusiastic and went about the task of producing this soap for me. On the arrival of the soaps I showed my partner, whom was happy as a clam as she just loves them! I then handed her the "special" soap and said this is a new one they have been working on. She first smelt it and said it smelt great and didn't seem to notice the wording. I prompted her to read the writing inside, and immediately a smile formed on her face and she said yes. Later she said that the surprise of the situation and the form it came in made the experience so good, who would propose in a soap? 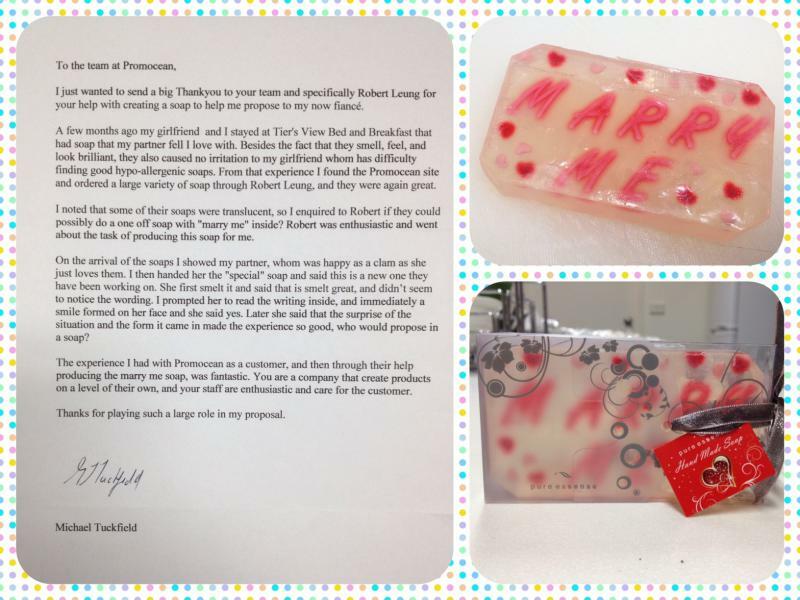 The experience I had with Promocean as a customer, and then through their help producing the MARRY ME soap, was fantastic. You are a company that create products on a level of their own, and your staff are enthusiastic and care for the customer. Thanks for playing such a large role in my proposal. I had the pleasure of using your products where we stayed at the Blue Green House in NSW... how soft our hair felt after using the SPA range and it smells beautiful. We love these products so much we are putting in an order with extras for our family & friends. I am so ever grateful that you have created this Pure Essense Skincare because it is a blessing to the World and to my skin...I am a dancer and skin is often dehydrated & I sweat most of the days, but the Regenerative series, they are all very light and are absorbed very quickly & easily by the skin. I use to have oily skin, but not anymore now, always hydrated and plump - like fresh Japanese Milk Bread out of the oven. So, thank you Robert for your wonderful creation. Love love love Pure Essense. Our recent stay at one Tree B&B in Auburn, SA was delightful in many ways. One of those was the discovery of Sacred Life toiletries. Nicely, and biodegradably packaged, scented with the Australian bush and feeling absolutedly luxurious to use. We are now you fans, and looking forward to purchasing some larger containers for house usage. We are looking forward to a long and appreciative relationship with your company and its products. On our recent visit to The Wallaroo Marina Apartments in South Australia. I was pleasantly surprised at the quality of the shampoo & conditioner supplied in the apartment. Having travelled extensively around S.A with my job I have always taken my own toiletries as the ones in the hotels leave my hair frizzy, dull and dry. Not so with the SPA range of Pure Essense Green tea & Pomelo conditioner. They were so good it prompted me to find where I could buy the products - which I now have. I also thank you for the face serum & day cream - both feel lovely on my skin. Well done and thank you for such lovely products that give great results! My husband and I were on Holidays at the Vue Apartments, Geelong, I was fortunate enough to use your Spa range of products. When I smelt the fragrance of the Antidote soap, I just had to try it. It left my skin feeling fresh, clean and smooth and I love that it contains all natural ingredients....Olive hand and body lotion, leaving my hands and skin soft and supple....I love using Pure Essense items and can't wait to continue using these wonderful products in the future. I travel extensively for work, and having not stayed for some time, I returned to the Royce Hotel. I discovered your Sacred Life products beautifully presented by the hotel in my room. Even though, I always carry my own favourites, I couldn’t resist trying them! Well I LOVE THEM - & took them all home. They are excellent quality & the fragrance is amazing. I would go back to the Royce just for your products!!! HI, On a recent stay at the Brighton Savoy, my daughter and I discovered little bottles of luxury Green Tea shampoo & Pomelo conditioner. We all LOVED your shampoo and conditioner, it made our curly hair soft and shiny and tame - and that was after sun exposure and beach exposure! Our hair looked great, felt great and smelt great!! We all wanted to let you know your product is GORGEOUS, we LOVED IT and THANK YOU for such an amazing products!! Sending you wishes for every success in the industry- you have truly nailed it !! And deserve it!! 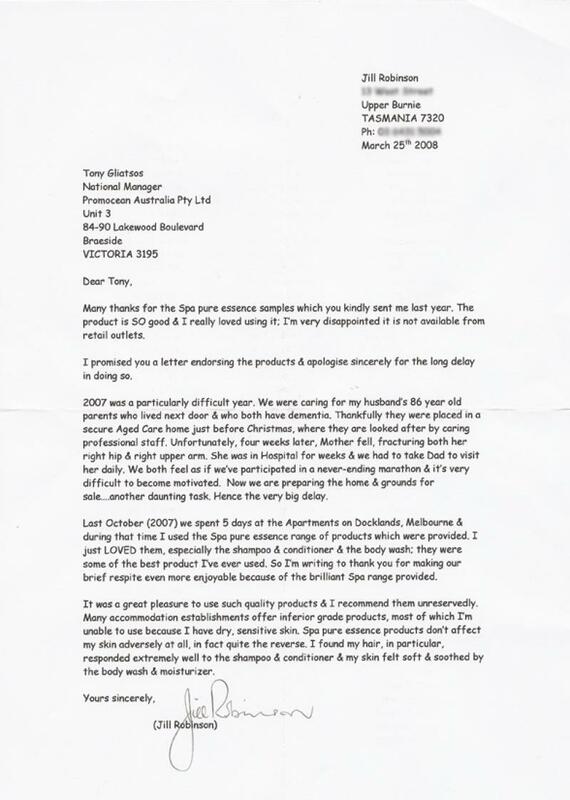 We just wanted you to know that we here at Fernwood Chirnside Park are pleased with the quality of service and products that you and your company provides. We have been getting quite a few very nice compliments from our members about the Pomelo hair conditioner and Rosemary Olive Body Wash! 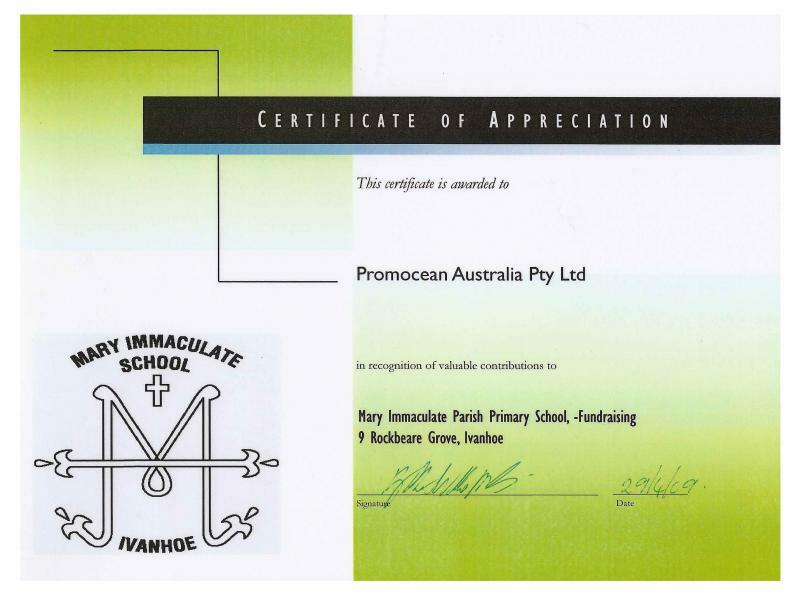 We will be recommending you and Promocean to all other Fernwood Fitness Clubs across Australia and look forward to doing business with you for years to come. Thank you for giving me a sample of the new Regenerative amenities, especially the eye serum and the face cream. The eye serum in my opinion is comparable to the Estee Lauder serum that I currently use. I gave one of each sample to my 28 year old daughter; she ask me where she could purchase it. This is coming from a young woman that is used to some of the more expensive products on the market. Dec 2013 Bessie Stewart Vic. I have been searching the shops for the last 2 months looking for Sacred Life products and have not had any success until I searched the internet and found that there is an outlet in Braeside. I am very pleased that I am now able to obtain these products, as they are most compatible with my skin ( I suffer from light Ezcema). The soft fragrance is delightful & not overpowering for me. I found the products when I stayed at Tamarind Sands Resort in New South Wales. On a recent trip to Tolarno hotel in St Kilda, I used the Sacred Life Lemon Myrtle Shampoo and Kakadu Plum conditioner and just Loved it. Having grown up in the Dalwallinu district I am very familiar with the Quandong tree and have often eaten its fruits. Recently we stayed at Silverwater resort and saw the toiletries left for us. Usually I bring our own shampoo etc.. this time I forgot! However decided to try this new set of products Silverwater had begun using. To tell you the truth, I didnt have high hopes as usually hotel amenities aren't too Great! WOW! What a surprise I got! I used the Green Tea Hydrating shampoo!! I absolutely Loved the way my hair felt, looked and smell! My usually oily hair was silky, soft and CLEAN!! I am in love with all your products we tried! Thank you so much for creating such a wonderful natural based set of products! You definitely have me as a customer. My friends and I have just returned from a short holiday in Lakes Entrance staying at the Esplanade Spa Resort. It was a delightful holiday with many happy memories, one of which was the discovery of your beautiful toiletry products in our apartments. We all commented on the lovely perfume and the softness of your Pure Essense Olive hand cream and were surprised by the gentle nourishing hair products especially the Pomelo conditioner. We decided to write to you for information about retail outlets close to home and to thank you for producing such wonderul products. Your toiletries are head and shoulders above similar products I have used in many Hotels and Motels over the years. Thank you for pampering us. We wish you all the best for your business. 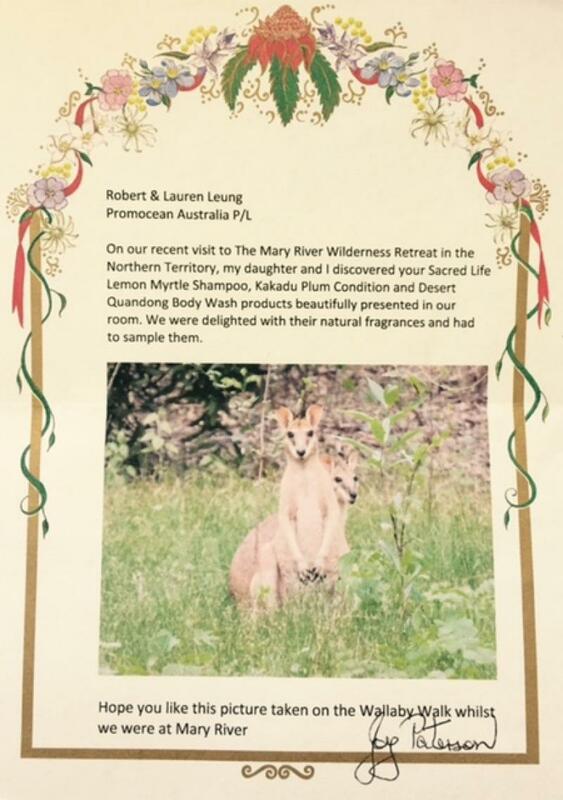 My wife was very impressed by the Sacred Life range of products at the Kangaroo Island Wilderness Retreat. 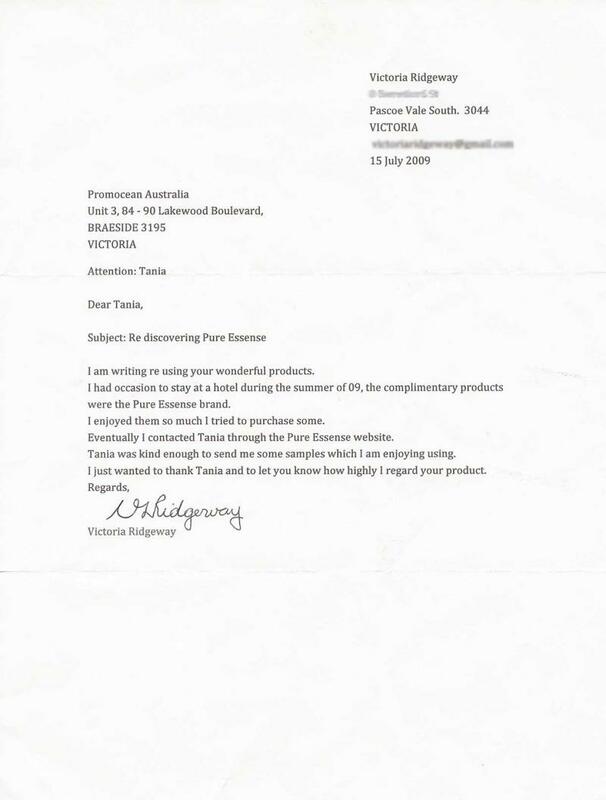 She particularly liked the Desert Quandong body wash and we have been hoping to find the product in store since then. She has tried a number of products over the years and this range stand out as her favourite. 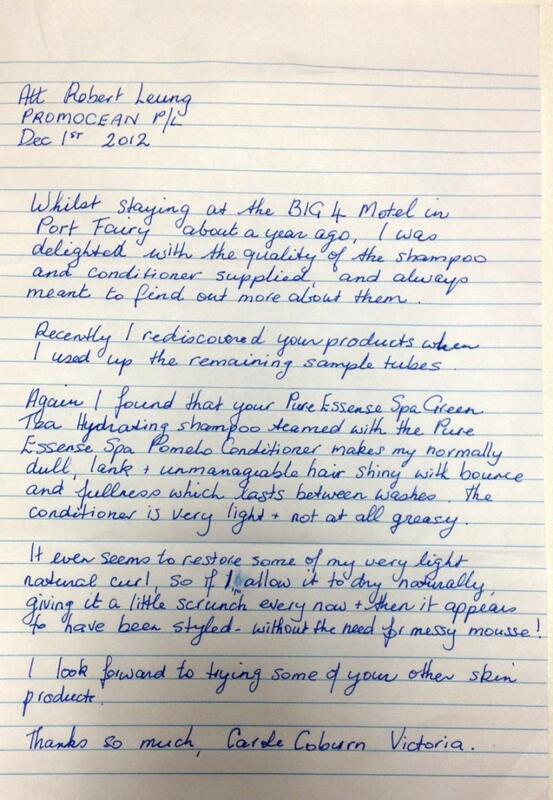 I just wanted to write to express how much I love the Pure Essense Green Tea Shampoo and Pomelo Conditioner. I used these products for the first time on the weekend when we stayed at Vue Apartments in Geelong and I can honestly say I have not used a better Shampoo and Conditioner. My hair usually goes oily within a day of washing it, but since using your products I haven't had to wash my hair since Saturday night and it's now Wednesday. I would also like to mention that I think the Rosemary & Olive Body Wash and the Olive Hand & Body Lotion are also amazing products! I have made an enquiry about purchasing the Shampoo and Conditioner from you after only using them once...now that's saying something. Can't wait to use these products again. 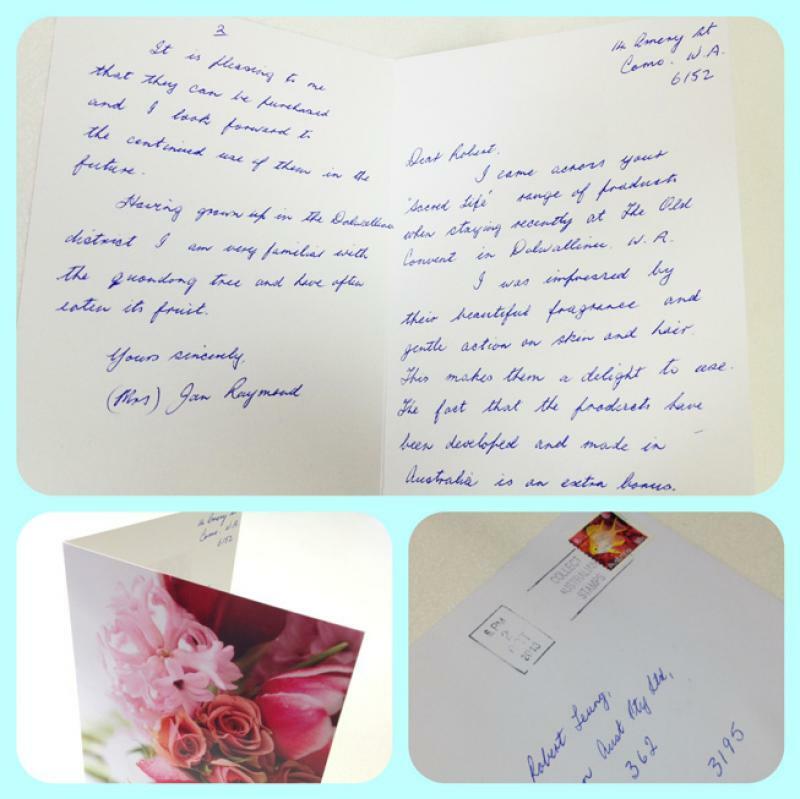 I am writing this letter to say not just how in love and satisfied I am with your products but the great customer service you provided! How promptly you have replied to my enquiries. First came in contact with your product - SPA Range - Green Tea Shampoo & Pomelo Conditioner @ The Great Western's Hotels in Melbourne. Hesitant I was to use hotel products, due to bad experiences in the past...Had gone for a swim and noticed didn't pack my Shampoo & Conditioner. After using this product the SPA Range especially the Pomelo Conditioner... my hair was silky, soft.... easy to manage... smell left in my hair was amazing. Was fortunate to have came across this product. I brag about this product to all my family & friends. I am truely a 110% satisfied customer no doubt. I am your number one fan of your Pomelo Conditioner SPA Range. Recently my husband and I had seven days away staying at the Esplanade Resort and Spa in Lakes Entrance Victoria. I used the toiletries supplied and found them to be fantastic. The hand and body lotion was great after a day of fishing it left my skin very soft and smooth. I have blonde coloured hair and your Shampoo & Conditioner made it lovely and soft and with a shine which I don't usually have. The whole SPA range was great. They are some of the best products I have ever used. I look forward to using them again in the future. Thank you for your prompt response to my enquiring regarding your Pure Essense Spa Green Tea Hydrating Shampoo and Pomelo Conditioner. As mentioned in my email, I had tried to source the product but was unsuccessful. It was a relief to find you are able to provide the product direct. I first used the shampoo and conditioner on a visit to Newcastle, NSW and was extremely surprise with the result. I have very fine hair.... after using the shampoo and conditioner, my hair felt soft and silky and kept its shape....I was more than happy with the result but the test for me was how my hair would respond to the product in Canberra where the water is hard. Surprisingly the result was the same. Thank you for such a wonderful product. It is also satisfying to know the ingredients are natural, dermatologically tested and not tested on animals. Recently I stayed at the RACV Resort, Cape Schank and was very pleasantly surprised at the excellent quality of their bathroom toiletries. Your Pure Essense Spa Range is simply delightful, my particular favourite is the Rosemary & Olive body wash which I found to be most refreshing and with a lasting fragrance. These products are definitely some of the best on the market, congratulations on an excellent Australian product. Recently I was lucky enough to enjoy a weekend away at RACV Resort Inverloch where I discovered your Rosemary & Olive Body Wash and Olive Body Lotion products. I loved them!! I have always used high quality body products and found this range exceeds them all. Thank you and I can't wait to try the Green Tea Shampoo and Pomelo Conditioner in the Spa Range. 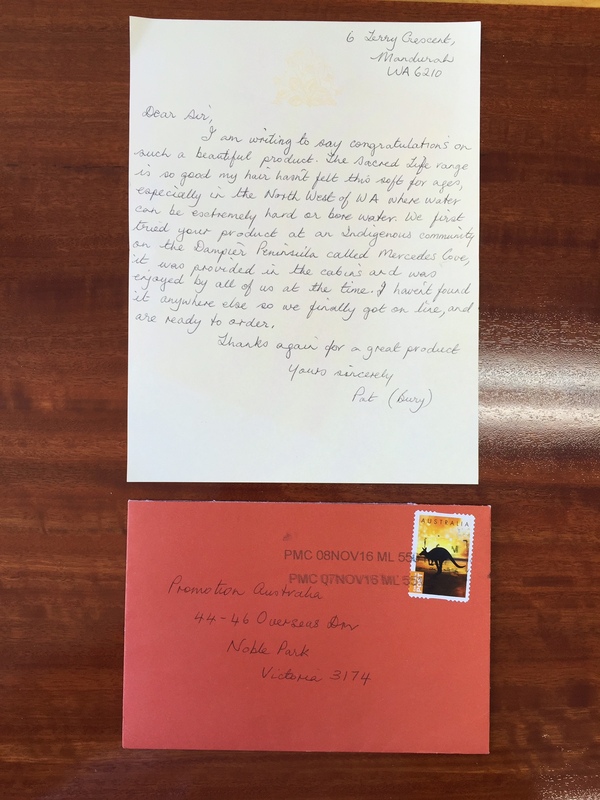 I write to congratulate you and the team at "Promocean" for the excellent product range we have been using at the property for now over 12 months. The amenities range, namely the Shampoo, Conditioner, Bodywash, Body lotion and facial soap are of above average quality, as are the facial and toilet tissue. They also represent very good value in this competitive market. I have had many favourable comment made to me from my clients regarding the ease of use and wonderful quality of your amenities range. More recently (end of February) I have 2 ladies.... travelling through Melbourne .... and had stayed at the previous evening at the Hotel Windsor in the city..... Both made a point ..... your product far exceeded their expectations and also that of the one being used by Hotel Windsor. To received strong feedback as this is testaments to the quality of your products and I have absolutely no hestitation in recommending it to everyone within the hospitality industry. Last Christmas my family and I stayed at Punthill-Flinders Lane in Melbourne. I had forgotten to take my shampoo and conditioner and I was not looking forward to using the hotel products as I have never found them to be any good. I was pleasantly surprised by the Pure Essense Spa Green Tea Hydrating Shampoo and Pure Essense Spa Pomelo Conditioner. I had breast cancer 9 years ago and I lost my beautiful long luxurious hair. My hair eventually grew back but not in the same condition. My Hair is very dry, frizzy and unmanageable. I have tried many products and have not been satisfied with the results and many aggrevated my psoriasis. Your product is amazing! After using the shampoo and conditioner, I found my hair manageable, shiny and it stayed that way for many days. It was also very gentle on my scalp. I don't want to use any other product now, I am hooked! Thank you so much for making a wonderful product. I was fortunate enough to be given some of your product by a friend. I loved it, the lotion is a beautiful product readily absorbed into the skin with no oily residue. I thought the fragrance of both the "Sacred Life" range and the "Olive" Spa range were absolutely gorgeous! I look forward to experiencing these wonderful products again. 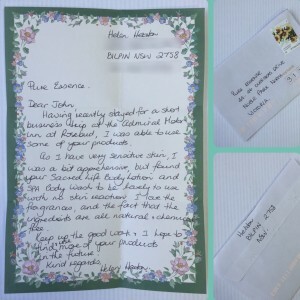 I recently stayed at Bannisters in Mollymook and was so impressed by the Pure Essense hand made soap that I kept the packaging........It was fantastic to receive prompt attention and such a courteous response...... The soaps smells divine and my skin has never felt so smooth. In the past I have avoided soap because it always tended to dry my skin out. Pure Essense handmade soap has definitely changed my mind.... I was at Mollymook for a work conference and many of the attendees commented on the soaps -- both male & female. The staff at Bannisters said that lots of guests mention the soap and often ask where they can purchase them. 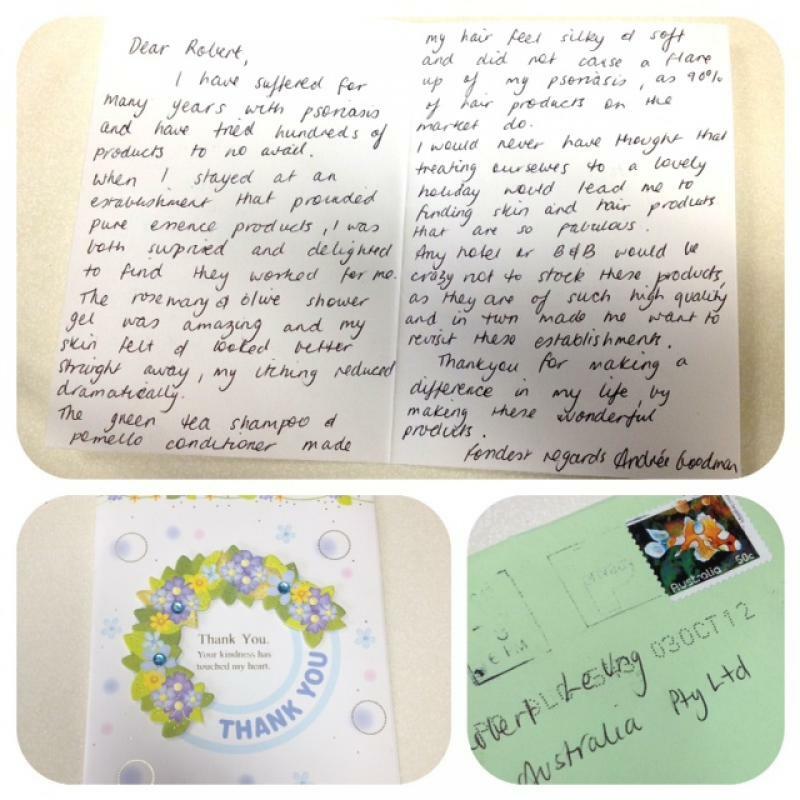 Thank you for taking the time and effort to produce such lovely, natural products. 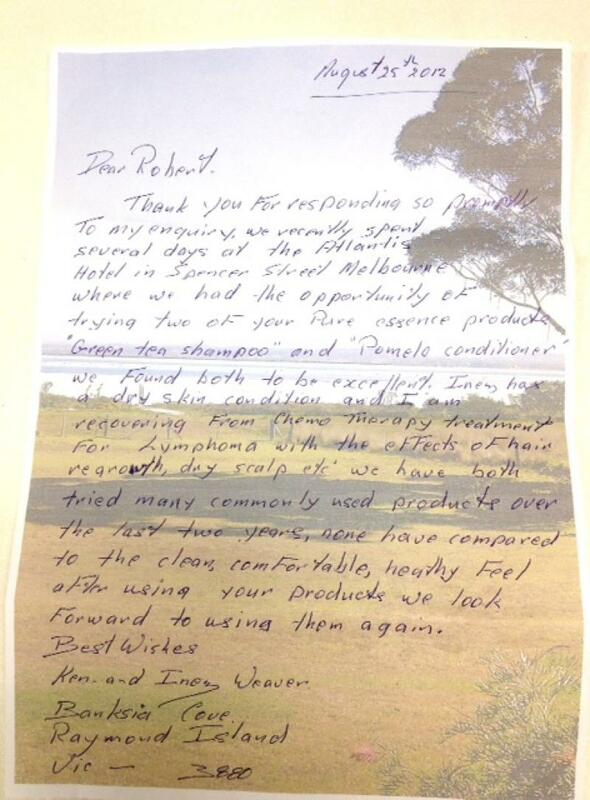 Whilst staying at the Big 4 Motel in Port Fairy about 1 year ago, I was delighted with the quality of the shampoo and conditioner supplied ....... I found that your Pure Essense Spa Green tea Hydrating Shampoo teamed with the Pure Essense Spa Pomelo Conditioner makes my normally dull, lank, unmanagable hair shiny with bounce and fullness which lasts between washes. The conditioner is very light and not at all greasy. It even seems to restore some of my very light natural curl, so if I allow it to dry naturally, giving it a little scrunch every now and then, it appears to have been styled -- without the need for messy mousse! What a pleasure to deal with an organisation so dedicated to their customers and their products. Thank you, thank you, thank you. We look forward to our continued use & spreading the word. 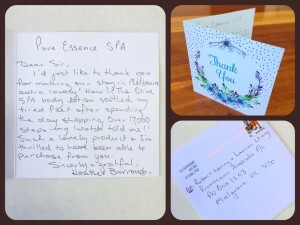 My husband and I recently stayed at a lovely cottage in Beechworth and used the Pure Essense range for the first time. The green tea shampoo and conditioner was fabulous.......and I have since also used the soap and will continue to use if from now on. Thanks again for introducing me to such lovely products. 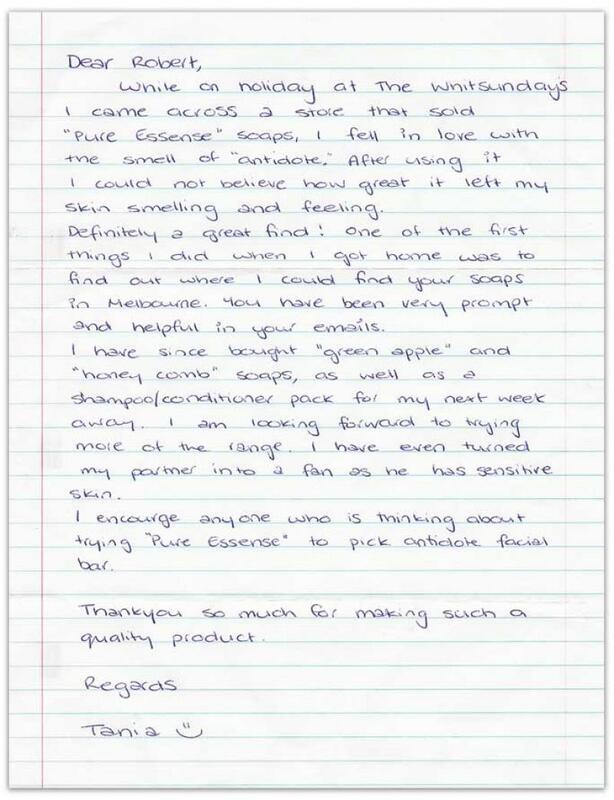 I first experienced the Pure Essense products while staying at Tiers View in Woodside SA. The Green tea shampoo & Pomelo conditioner produced volume and softness when I used in the rain water. My partner and I recently returned from a stay at the beautiful Yabbaloumba Retreat in the Sunshine Coast hinderland. The cottage was stocked with Pure Essense products...and I loved them. ...Antidote soap bar....made from natural ingredients. It left my skin feeling soft and moisturised, smelt fantastic, no animal products (what more could you ask for?). ....i would just like to compliment Pure Essense for the wonderful products I used on my trip " down under" while staying at the Cube Apartments. My husband and I recently stayed at the Mystery Bay Cottages on the NSW south coast. While it wasn't a romantic getaway - given we had our toddler with us,....it was made all the more special by our new find of the luxurious honeycomb body bar from Pure Essense. ...It smelt like fresh oranges and flowers. .. It acted like a natural exfoliator and after using the soap, my skin was soft and smooth. Hi, Im from Singapore and I simply LOVE your green tea shampoo and conditioner.....while staying @ Jasper Hotel. OK, my hair seemed fine after using twice, then I bought some home and continued using them. Surprise! I noticed that my hair loss was minimal falling after every shampooing. Im desperate now! Where can I buy them in Singapore?? I love them! Thank you very much for my hair growth too! Pure Essense shampoo solved my hair problems. 21 April 2010 Heather Schroeder VIC. 24 April 2010 Wendy Hull Vic. While staying at the Cube in Melbourne............I was very impressed with the Body lotion and Body wash. I found the body wash to really cleanse the skin on my face and the body lotion to moisturise and protect my skin against the city pollution. Very impressed. Carol. ....Just a quick note to say how thrilled I was to receive my parcel. I was so impressed with the Rosemary & Olive body wash. It has such a gentle fragrance and leaves my skin so clean & silky. I am looking forward to using the other samples, especially the honeycomb soap which looks so good you could almost eat it. ...Just wanted to let you know how impressed I was with your Spa range shampoo, conditioner, body wash & moisturiser. I must say I was surprised as I was expecting the shampoos to leave my hair like straw but instead my hair felt thick & smooth and the body wash & moisturiser made a Heat Rash I had clear up almost immediately. 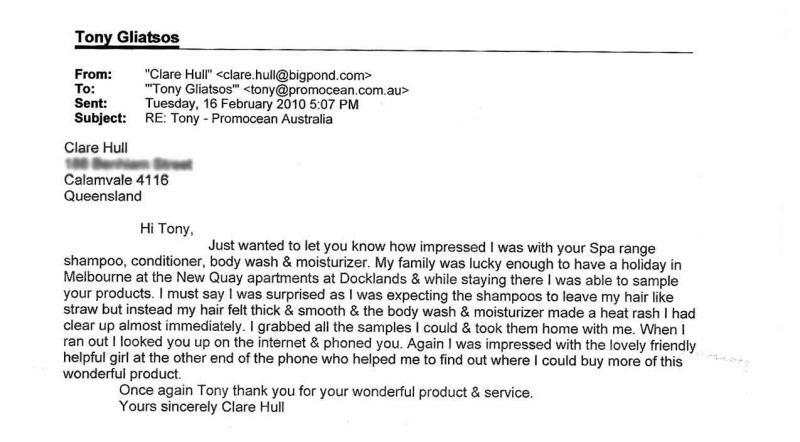 ...I was first introduced to your body care products at the Alto Hotel on Bourke st Melbourne. My friends and I were so impressed by the quality of these products and we wish to say it was a delight to have them provided. We are certainly planning to be purchasing these products in the future. Wow, a recent (anniversary weekend) stay at the beautiful Bannisters Point lodge, NSW Soath Coast was made all the more beautiful by the incredible personal products offered in the rooms. I can say I have never come across such high quality products in accomodation before. Your Honeycomb soap is truly to die for. Well done. I would like to express formally how much I love Pure Essense range, it exists in a league of its own compared to most other amenities found in hotel establishments (which are often poor quality). I particulary love the Green tea shampoo & Pomelo conditioner which left my hair feeling lovely & silky. I hope one day the products will be available through retail outlets. All the best Julia. 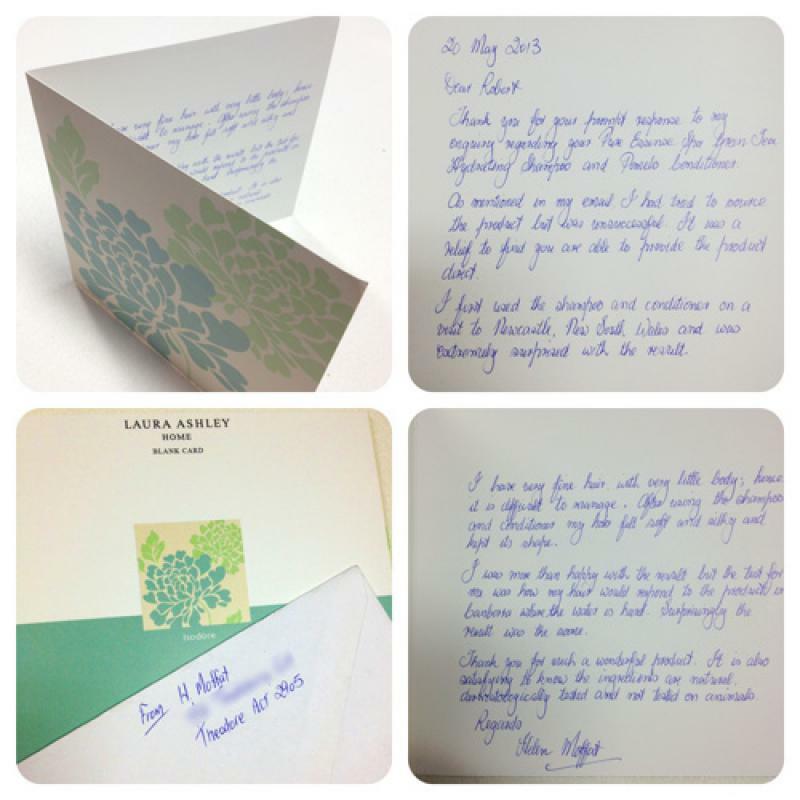 I am writing re using your wonderful products. I had occasion to stay at a hotel during the summer of 09, the complimentary products were the Pure Essense brand. I enjoyed using them so much I tried to purchase some.........I just want to thank Tania and let you know how highly I regard your products. regards Victoria. Hello, Im Lisa Oliver and wanted to let you know I am So in love with one of your products and wondering if I could purchase some. I have never smelt anything like it in all of my 38 years of showering. The Rosemary & Olive body wash. I used it at a holiday unit up the North coast and simply fell in love with it.. 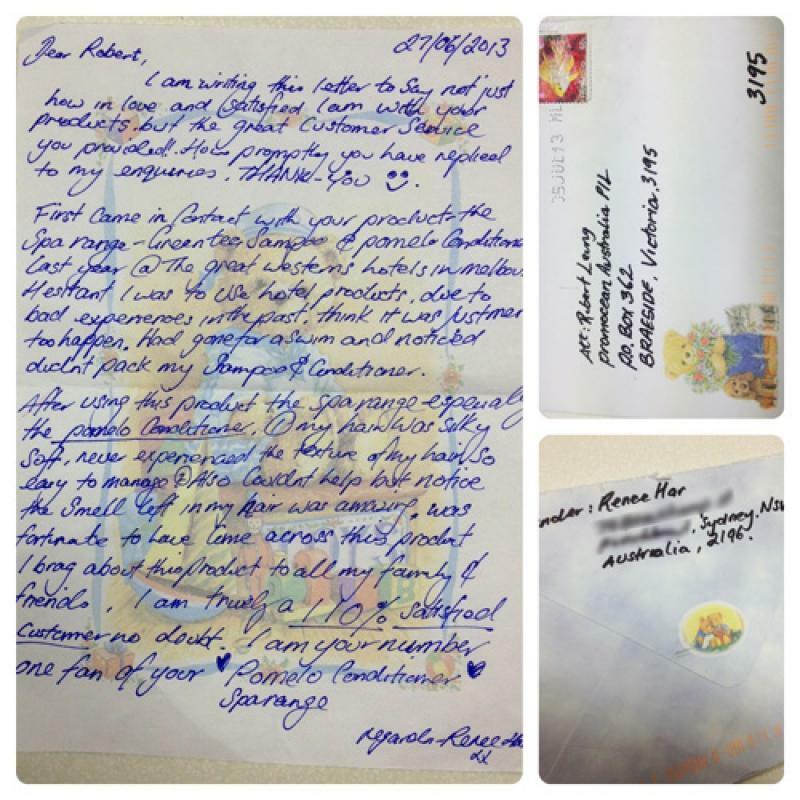 I just wanted to write to you and tell you how much I love your products, especially the "Olive hand and body lotion". It smells so beautiful and feels really lovely on my skin. Its the little things when staying at a hotel that helps to make your stay feel more luxurious and the quality of the toiletries is one of them...Thanks for a great product. 3 November 2008 Kay Thomas S.A.
My husband and I were staying in a lovely self contained cabin....I decided to try the body wash. I just loved it and it was your Pure essense Rosemary & Olive body wash. I have been looking for a body wash for years and I was excited to find one. I love the smell, the feel, and as I have sensitive skin, it didnt effect it in any way. Im just letting you know that it is a wonderful product. 25 March 2008 Jill Robinson TAS. 21 Feb 2008 Meg Higgins VIC. Since discovering your Mango Shampoo and Lime Conditioner a few days ago, I am now converted! My hair felt clean, healthy and looked very shiny. 22 Jan 2008 Debbie Baker TAS. 7 Nov 2007 Fiona Venables VIC. 18 Jan 2007 Daytona Electrical VIC. 26 July 2007 Mick Amato VIC. Thank you for supporting our STAR mentoring program. Your donation has been gratefully received and will be put to maximum benefits where it is most needed.